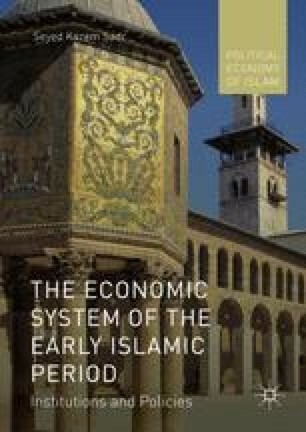 The objective of this chapter is to elaborate the fiscal policies of the early Islamic era. These policies are included in the terms of references of regional governors in persuading the objectives highlighted Chap. 4. In order to become acquainted with these policies, first, different kinds of taxes will be introduced and the characteristics of them will be inferred. Taking into account their common features, we shall set forth a tax model from the early Islamic era. Then we shall enumerate the different expenditures of the Baitul Mal, so that the public revenue–expenditure cases and their general features will come to light. The method in which these expenditures are financed and balanced against the revenues of the Baitul Mal will also be discussed. Taking into account the features of early Islamic taxes, the methods in which they are spent and the impact of these policies on growth and economic development; the fiscal policies of the early Islamic era will be deduced.